Ooh, all my jam making things have arrived! 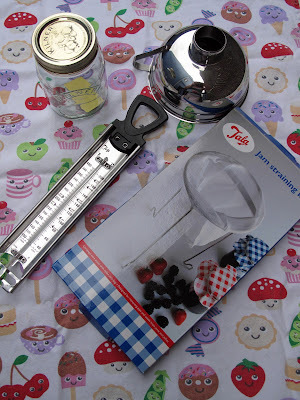 I bought a jam thermometer, funnel, jam strainer, and a couple of jam jars (I also have a stash of recycled ones). I didn't buy a maslin. To be honest I had never even heard of a maslin until last week. I thought they were a bit expensive, plus do you really need one? Maybe I will buy one next year if my jam turns out to be very successful. So, what jam should I make? Strawberry jam is my favourite, however the rain and the slugs have put paid to that idea. We have lots of gooseberries, blackcurrants, and redcurrants. I'm not too sure about gooseberry jam. This leaves me with the currants. So, blackcurrant jam, redcurrant jam, or mixed currant jam? I have until Thursday (weather permitting) to make my mind up! Make gooseberry jam, it is the easiest thing ever to make & tastes fab. I was so surprised by how much i liked it. Good luck with whatever you decide to do. Now i'm not an expert in any way, i just like to have a dabble. I picked my gooseberries on Monday just gone. I had a mixture of sizes. If your using sugar and you will be to make jam i dont think size or sweet/sour makes a difference. I was skeptical about making gooseberry jam, but it was just so nice.